Have you ever moved to a new place? Imagine what it was like to move to Oberlin before streets, sidewalks or buildings were built; before there were schools, churches, or parks. Was there ANYTHING here, then? Yes. There were trees...trees...trees... and, more trees. In fact, a huge, thick forest covered almost all that is Oberlin today. There was only one small opening about twenty feet square, on the south west corner of today's Tappan Square. Covered with clover in 1833, this area had been used for many years as an Indian encampment. Everywhere else trees were so close together there was no room for anything else. The earliest settlers first had to chop down trees so there would be space for buildings and open fields where fruits and vegetables could be grown. 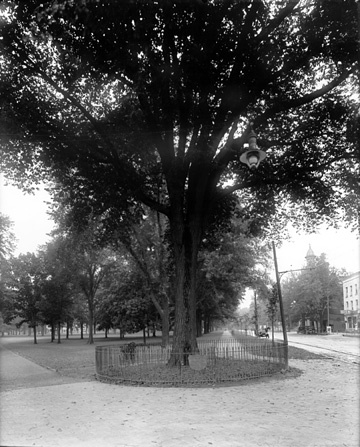 Tappan Square became the first area to be cleared of all but a few trees. Of course, the wood from all the cut trees supplied logs and lumber for building Oberlin's early cabins, houses, and stores. Wood also provided material for fences and for fuel. It's important to remember that Oberlin was not the first village in our county. Small settlements had sprung up in this area as early as 1816. Some were too small then to be called villages, and were often only a few houses and farm buildings clustered together. Members of the same family usually made up these first settlements. For instance, the earliest settlers in Carlisle were members of the Bacon family, who moved to this area from Vermont. Gradually these settlements grew into villages, and sometimes towns. Three of these early settlements were named "Carlisle," "Pittsfield," and "Russia." These three names are now township names in our county, Lorain County. Russia Township was renamed "New Russia Township," just a few years ago. Oberlin's first settler was a man from nearby Brownhelm. His name was Peter Pindar Pease. He was an expert carpenter and had built many buildings in Brownhelm. He cut down the first tree in Oberlin on March 15, 1833. On April 3rd, he and two friends began cutting a road through the forest and underbrush to Oberlin. This road had to be wide enough to make room for wagons pulled by oxen and filled with heavy construction tools and food supplies for the builders of the new town. only a shed with no door, no windows, and no flooring, excepting rough slabs which [covered] one half the scanty room. A ditch furnished water. The first meals were cooked [outside]... beside a stump; bread was baked upon the top of a poor box stove or in the ashes. Mr. Pease was to take charge of building the college's dormitories and classrooms. But before they could be built, in-coming villagers and students needed places to stay. The Pease family invited all newcomers to stay with them until other housing was available. Because their cabin was small (only about 20 x 23 ft.), they were "very much thronged," according to one of the very first students, named "Isaac." He later described his first night at the Pease cabin. After dinner and family worship with the Peases and other people who were staying there, something was said about sleeping in the "field bed." Isaac had never heard of such a bed and had been wondering where everyone was going to sleep. Well, he soon found out. One of the colonists took a candle and climbed up the ladder to the loft. One person after another climbed up and took his place on the floor. The field bed turned out to be a straw bed spread out on the floor from one end of the building to the other, without any division or partition. That night, fourteen people were packed together in the loft! Isaac didn't get much sleep that night. An elm tree grew next to the Pease cabin. Perhaps it was the same elm tree Shipherd and Stewart prayed under earlier. Instead of cutting the tree down, it was saved, and it grew to be tall and strong. It shaded this corner of Tappan Square for almost 150 years. People began to call it the "Historic Elm." Finally, it became old and sick and was cut down April 13, 1965. The area where the Historic Elm stood is now marked with a fence, flowers, flags and an historic marker. Today, when we see or walk past this part of Tappan Square, we remember that it was near this spot that the first Oberlin family built their cabin so long ago. Some of Oberlin's early buildings were built on Tappan Square. But, there have not been buildings on the square since 1930. Led by the request of Charles Martin Hall , the areas became open space instead, with college and town buildings around its sides. However, there are still a few trees on the square that were growing there in the the 1830s. Today, we feel sad when big, old trees have to be cut down. We miss their beauty and their shade. But, we no longer live in dark forests where there is no sunshine and no view of anything else but trees. One man who lived in Brownhelm during this time remembered that whenever a big tree was chopped down, people would rush out of their cabins to see how much further they could see without the tree to block their view. He said the sound of a crashing tree was "the gladdest sound of our childhood." Visit Charles Martin Hall on the web! All this chopping and building was hard work. As the village slowly took shape, more and more land had to be cleared for roads and farmland. Soon, without all the old tree roots to soak up rain and melting snow, water had no place to go. Mud was everywhere. There were no sidewalks then, so wood was used to make boardwalks that were placed outside of stores and shops. That way, people could walk from one place to another without sinking in mud up to their ankles. Horses didn't like all the mud either, especially when the wheels of the carriages they were pulling got stuck deep in the mud. Oberlin men did the tree chopping, building, road making, and farming. Oberlin women worked hard, too, cooking, gardening, sewing, cleaning, and taking care of their children, as well as Oberlin students. 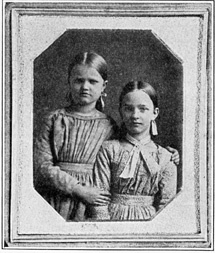 Many Oberlin families took in students from the College to live with them. This meant that most mothers and wives prepared meals for many people every day. Often ten or more grown-ups, students, and children would sit around a table set for dinner. Much of the food came from the College farm and from small home gardens. This was before the time of canned or frozen foods that you can find in today's supermarkets. This was also before sewing machines, clothing stores, and shopping malls. Whatever you wore -- shirts, dresses, trousers, shoes or socks -- everything had to be made by hand. Women did most of this work along with the cooking, washing, drying, and mending of clothes. Because there was no electricity until the 1890s, there were no washing machines, dryers, or electric irons. Clothes were washed by hand in tubs, hung to dry on clothes lines, and later ironed with a flat iron that had to be heated frequently on a wood-burning stove. Women frequently mended clothes at night, by candlelight, after all their other jobs were done. By 1852, over one-thousand students were enrolled at the College. Most of these were young students between the ages of fourteen and eighteen. They studied in a preparatory school that was operated by the College. Many young people found it difficult to prepare for college, especially southern black students or students who lived in small villages or on isolated farms. Because Oberlin College operated this preparatory school, many families moved to Oberlin so that their children might attend this school. The school helped them learn what they needed to know in order to finish high school and even go on to college. Monday April 21st: Played ball in the afternoon with johnny kendall. went with susan graves to the shoe shop and the post office. 23d: had the headache most of the day. in the afternoon went to see adelia hall. we went out to the barn and hunted eggs some. we scart one old hen of her nest. got one egg from that nest and carried in three eggs. one was a double egg. she showed me a basket of eggs they had got that day...went with smith after the cows. went into the woods with him and got a large bunch of flowers. got overset in mud in the ditch. Does the Oberlin life of Mary Cowles seem much different than yours, almost 150 years later? If you lived in Oberlin during its first years, what do you think your day would be like? Write a diary entry that tells about one day for you and members of your family.